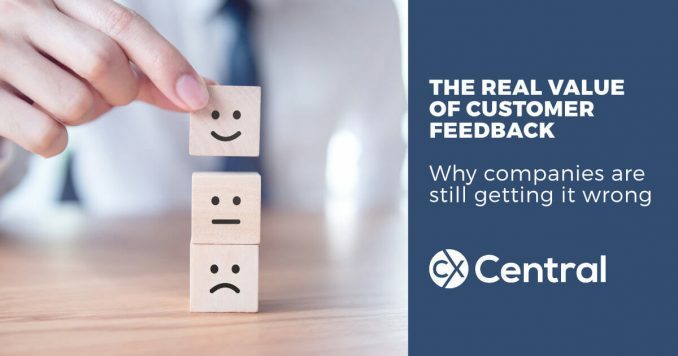 Most organisations collect a lot of customer feedback in the form of customer satisfaction surveys, website forms, complaints, NPS and many other sources. Knowing what customers think of your brand is a valuable insight into the performance of your business. If customers like your product or service and its delivering value to them and their experience is great then you can assume that they will continue to do business with you. If you are lucky they might tell others about your business. On the other hand, if customers don’t like your product or service and their experience is not great, you can be assured that they are less likely to do business with you again. The key here is to act on the feedback. What happens to most customer feedback that is collected? • Most organisations don’t do anything with it. • Some use it only to calculate a headline score like customer satisfaction or NPS or Customer Effort Score (CES). • A few go a bit further and call back the customer, understand their issue and try to resolve it as soon as possible. But very few organisations derive maximum value out of customer feedback which is to analyse and understand the feedback, integrate the learnings, feed it back to the relevant department to resolve the root cause and communicate to the customer and staff members when its resolved. So why aren’t organisations extracting maximum value from customer feedback? It is not easy to read and understand every comment provided by the customer. Text analytics software can be used to group feedback into certain categories to provide high-level insights into what is working well and what is not. For e.g. the categories can be marketing, sales, support, product, billing etc. It becomes easier to assign each issue to the right department and drive ownership and accountability. Usually, there is no clear ownership of customer feedback. It is delegated to customer-facing teams without any framework for managing it. Customer facing teams do not have the authority or expertise to run cross-functional programs to prioritise, resource and resolve all customer issues. Every department has its own objectives and customer feedback may not necessarily be a priority for most departments. Most departments work in silos. For example, a relevant software issue that is causing pain to existing customers may not be part of the roadmap for the product team. Their priority might be to release the next version of the product on time. Existing customers have to endure the pain resulting in frustrated calls to support teams who are left to somehow manage these issues. This causes disengagement and erosion of trust in management. There needs to be a governance structure in place. An executive with the authority to prioritise and allocate resources should be the owner. Then there needs to be clear guidelines on ownership at the department level. A cross-functional council needs to be in place to discuss and prioritise the list of customer issues. Reporting structure with relevant metrics in place is critical to monitor the progress of initiatives. So if you have made the effort to extract data from the customer, and they’ve taken the time to provide it, why not make the most of it?